The platelet disorders are probably the most common cause of abnormal bleeding in patients. Platelet disorders may cause bleeding as a result of inadequate numbers (thrombocytopenia) or abnormal platelet function (thrombocytopathy). Bleeding resulting from platelet disorders is characterized by bleeding into the skin and mucosal membranes and prolonged bleeding, following trauma. ITP is characterized by thrombocytopenia (platelet count <100 × 109/L), shortened platelet survival, presence of anti-platelet antibodies in plasma, and increased megakaryocytes in the bone marrow (BM). Presenting clinical features are spontaneous mild purpura with rarely severe bleeding in <10% of patients., The true incidence of ITP is unknown. However, in the USA, incidence was put at 1/10,000 in children and 5.5/100,000 populations in adults, while the male to female ratio is variable as there may be male preponderance in children and female preponderance in adults., Incidence of ITP in Nigerian population has not been documented, but a study in Southwest Nigeria reported an incidence of 0.005% of all hospital admissions. This study reviewed and analyzed the clinical presentation, laboratory findings, and management options and outcomes of ITP cases seen at the Ahmadu Bello University Teaching Hospital (ABUTH), Zaria, over a 10-year period. This was a retrospective study involving the review of patients' case notes and BM register of all ITP cases seen at the Haematology Clinic and Haematology Day Centre of ABUTH from January 1, 2004, to December 31, 2013. Ethical clearance was obtained from the Health Research Ethical Committee of ABUTH. Data on gender, age, presenting signs and symptoms, packed cell volume (PCV), platelet count, and BM aspiration finding as well as blood transfusion and drug treatment were extracted and analyzed using Microsoft Excel and Primer of McGraw-Hill. Descriptive statistics and t-test were used for data analysis with level of significance set at P ≤ 0.05. There were a total of nine cases (three males and six females) giving a male to female ratio being 1:2. The age range of the patients was from 6 to 20 years with a mean and SD of 11.1 ± 4.9 and median of 12.0 years. Eight (88.9%) patients presented with epistaxis, while other forms of presentations are depicted as given in [Table 1]. At presentation, the overall mean, median, and range of platelet count were 27.3 ± 15.2 × 109/L, 25 × 109/L, and 12–58 × 109/L, respectively, while those of PCV were 25.7 ± 9.5%, 24%, and 15–44%, respectively. 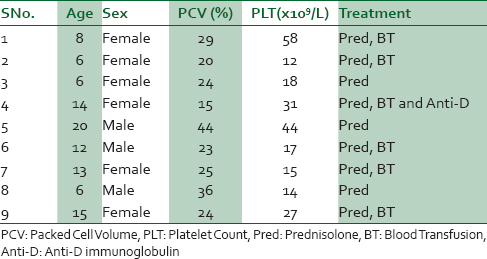 The presenting PCV, Platelet Count and treatment modalities used for each case are presented in [Table 2]. There were no significant differences between the mean ages, platelet counts, and PCV of male and females patients; 12.7 ± 7.0 versus 10.3 ± 4.1 years (P = 0.527), 25.0 ± 16.5 versus 26.8 ± 16.9 × 109/L (P = 0.884), and 34.4 ± 10.5 versus 23.0 ± 4.7% (P = 0.051), respectively, as shown in [Table 3]. Thrombocytopenia with platelet counts of <25 × 109/L was found in 5 (55.6%) of the patients. Similarly, 5 (55.6%) of the patients had PCV of <25%. All the nine cases had megakaryocytic hyperplasia in the BM. All the patients received oral steroid (prednisolone) therapy, six (66.6%) patients had blood transfusion support, but only one had anti-D immunoglobulin following relapse after therapy with prednisolone. [Table 2] further highlights on some of the laboratory features and treatment options of the patients. The mean time to cessation of bleeding was 8 weeks (6–10 weeks). None of the patients had other immunosuppressive therapy or splenectomy. Six (66.7%) cases were lost to follow-up after achieving remission and 1 (11.1%) died of ICH while 2 (22.2%) are followed up at the clinic. The finding of only nine cases over 10 years or 0.9 cases per annum indicates that ITP is uncommon in Zaria. Similarly, with a total of 405,880 new patients seen at ABUTH during the study period, an incidence of 0.002% for ITP cases was obtained. This finding is not surprising as reports from earlier studies by Salawu and Durosinmi (2001) in Ile-Ife, Southwest Nigeria, reported an almost similar low incidence of 0.005%. This further corroborates the fact that ITP is a rare disease worldwide. The median age of the patients in this study was 12 years in conformity with most reports that ITP is commoner in childhood. Furthermore, 8 (89.9%) of the patients in this study were <18 years of age. However, this younger age is at variance with a previous Nigerian study in Southwest Nigeria where the median was found to be 21 years. This may be attributed to the likely difference in the population genetics between Northern and Southern Nigeria. The number of females doubled that of the males in this study. This is similar to most reports that indicate a female preponderance in ITP cases, especially in the younger age groups, even though no specific pathophysiologic mechanism has been attributed to this predilection toward female gender. However, this gender disparity is said to disappear with increasing age of the patients. Epistaxis was the most common form of presentation, followed by gum bleeding, while purpura and menorrhagia were rare. These presentations are in stark contrast to the purpuric bleeds that are common in Caucasian patients. Similarly, a Nigerian study reported gingival bleeding as the commonest presentation and purpura was rare. This may be explainable to the fact that our patients are black skinned and thus identifying early pinpoint petechial hemorrhages may be difficult. Eight (88.9%) of the patients had anemia at presentation and 5 (55.6%) had grade 4 thrombocytopenia (platelet count of <25 × 109/L), but none had very severe thrombocytopenia or platelet count of <10 × 109/L. The anemia may be explained by the bleeding episodes before presentation to hospital. On BM aspiration smears, all the patients had increased BM megakaryocytes which is a cardinal finding in ITP and is considered reactionary to the peripheral thrombocytopenia. All patients were treated with oral steroids, but there was a high transfusion rate (67%) which may be indicative of the late presentation in our setting. However, only one patient had anti-D due to nonresponse to steroids, but none of the patients had splenectomy as a treatment modality. This could be due to the high rate of remission on oral prednisolone and the relatively high cost of the other modalities as most of our patients could not afford such treatment. Immune Thrombocytopenic Purpura (ITP) is relatively uncommon in our centre. Majority of the cases achieved remission on oral steroids though there is a high rate of transfusion due to late presentation. We would like to thank all medical doctors in Department of Hematology and staff of Health Information Management Unit, Ahmadu Bello University Teaching Hospital, Zaria, Nigeria. Hoffbrand AV, Pettit JE, Vyas P. Color Atlas of Clinical Hematology. 4th ed. Philadelphia: Mosby-Elsevier; 2010. Kühne T, Imbach P. Management of children and adolescents with primary immune thrombocytopenia: Controversies and solutions. Vox Sang 2013;104:55-66. George JN, Kojouri K. Immune thrombocytopenic purpura. In: Kitchens CS, Alving BM, Kessler CM, editors. Consultative Hemostasis and Thrombosis. 2nd ed. Philadelphia: Saunders-Elsevier; 2007. p. 123-38. Lanzkowsky P, editor. Disorders of platelets. In: Manual of Pediatric Hematology and Oncology. 4th ed. Burlington: Elsevier Inc.; 2005. p. 251-94. Diz-Kucukkaya R, Gushiken FC, Lopez JA. Thrombocytopenia. In: Lichtman MA, Beutler E, Kipps TJ, Seligsohn U, Kaushansky K, Prchal JT, editors. Williams Hematology. 7th ed. New York: McGraw-Hill; 2006. p. 1749-83. Warrier R, Chauhan A. Management of immune thrombocytopenic purpura: An update. Ochsner J 2012;12:221-7. Banihashem A, Farhangi H, Bazaz MM, Badiee Z, Ghasemi A, Hesari S. Comparison of dexamethasone and anti-D immune globulin for immune thrombocytopenia purpura in children. Rev Clin Med 2014;1:61-5. Salawu L, Durosinmi MA. Immune thrombocytopaenic purpura: 11-year experience in Ile-Ife, Nigeria. Afr J Med Med Sci 2001;30:99-103. Cines DB, Bussel JB. How I treat idiopathic thrombocytopenic purpura (ITP). Blood 2005;106:2244-51.